The entry of the United State's premier jet interceptor into the Korean War was triggered by the ever-increasing presence of the Soviet-built MiG-15 south of the Yalu River. The possibility of the USAF losing air supremacy over the Korean Peninsula was unacceptable. The 4th Fighter Wing got the call for combat in Korea. They were made up of a combination of new pilots right out of jet training and… the older combat veterans of World War II vintage. This combination of pilot types wrote and re-wrote the text books on jet warfare. Of the 40 jet aces that the war produced, the 4th Wing boasted 24 of them. 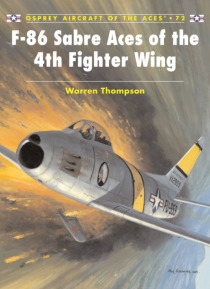 This book details these incredible pilots and the planes they flew.